For teaching my students I like to work with a framework to structure and summarize the course. So, here is one for the digital economy. In digital business we usually deal with goods (or services) that are fully or partly digital. In order to understand the digital economy you, therefore, have to know the specifics of digital goods. What characteristics do digital goods have? How do the resulting cost structures look like? And what follows from that for developing pricing strategies for digital goods? Having laid this groundwork, we can further analyze how digital goods are offered or used in markets. In these systems we have to deal with several characteristics as well. Very often network effects play a prominent role as well as switching costs and compatibility in developing a sound strategy for a digital business. On top of all that, we see more and more platforms in digital business. For some businesses the market does not only consist of two parties (seller and buyer), but of three or more parties, i.e. they are multi-sided platforms. 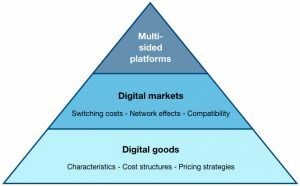 Multi-sided platforms not only combine all topics discussed with digital goods and digital markets, they present some further challenges (e.g. chicken-and-egg problem) for building and managing them successfully. We are used to think in terms of substitutes (one product/service replaces another). So our competitors are those with similar products and our pricing needs to be lower than our competitors’ (or our quality needs to be better). In the digital world, however, complements (products/services which complement each other) play a much more important role. This has significant consequences on who our „competitors“ are, how to form our relationship to these „competitors“ (or partners) and how to set prices (complements influence each other). Please find my updated paper on Internet business models here. See the abstract of the paper for more details. Business is more and more becoming a “platformed” world. More and more of the largest companies (based on market capitalization) are platforms. For an economist, of course, this development is not surprising. Platforms exhibit massive economies of scale (supply-side and demand-side economies of scale/network effects) and, thus, are inherently driven towards fast growth. Many business leaders are now confronted with competition from platforms and soon realize that it is very hard to fight against platforms. So some of them are thinking about becoming a platform themselves. But be well aware, that platforms need a much different management than conventional businesses. All digital businesses work with near-zero marginal costs in an important part of their business. Very often digital businesses are exposed to network effects, indirect and/or direct network effects. Digital businesses deal with goods or services that are completely or partially digital. Even an online shop wich sells physical products operates on a digital platform. And the main feature of digital goods is that they have near-zero marginal costs. Zero marginal costs have a very profound and far-reaching impact on many business decisions. Digital goods or services are offered in digital markets. Very often such markets show network effects, wich often play a crucial role for the business. More and more digital markets are not only built by two parties (buyer and seller), but by multiple parties. These multi-sided platforms require a significantly different management and represent definitvely a new type of business. Are social platforms an adequate solution for social failures? When Prof. Ralf Wagner and I started to plan the course “Social Media Management” at the RFH Köln, Ralf introduced me to the ideas of Prof. Mikolaj “Misiek” Piskorski (former Harvard University, now IMD Lausanne). Prof. Piskorski developed the systematic of “social failures” which occur in the offline world and which social platforms try to solve (see: Piskorski, 2011, 2014). Piskorski’s premises are based upon the idea that social deficits can be solved by social platforms (social solutions) – the main challenge for a platform is to do it appropriately considering the intended target group. The author introduces a four-dimension framework which represents main reasons creating social failures: breadth, display, search, and communication. Let’s illustrate this with two examples (see: Piskorski, 2014): eHarmony solves (or at least tries to do so) the abovementioned four reasons for social failures by attracting many members to their website (breadth), knowing a lot of personal information (especially marriage-related issues) about these members by using a comprehensive questionnaire (display), connects them with other members who are, based upon the compiled information, probably a good “match” (search) and helps them to communicate, either via a feature called “Guided Communication” or alternatively via an open chat function (communication). Another example may be Tinder: This service attracts a huge amount of members (breadth), allowing members to present themselves by creating an account (and using their Facebook profile respectively, display), presenting other members in the nearby area (search) and offering the possibility to get in touch with these members after matching (communication). Do situations exist when social platforms are increasing social failures (thus failing to solve failures, even worsening them or creating new problems)? Are social platforms per se able to solve every kind of social failure? There is evidence that social platforms have the potential to create envy and jealousy in a romantic relationship or among friends as well as cybermobbing (examples for research in relation to these topics include Krasnova, Wenninger, Widjaja, & Buxmann, 2013; Muise, Christofides, & Desmarais, 2009). Thus, do social platforms make more couple split because they can “stalk” each other, thus arousing more envy? Do they offer more possibilities for bullies? What about the enhanced anonymity in this context? Web 2.0 probably offers a “mouthpiece” for hate speeches and opinions which should not find its way into the public. Wilson, Graham, & Gosling (2012) as well as Anderson, Fagan, Woodnutt, & Chamorro-Premuzic (2012) already collected an impressing amount of scientific reasearch covering these topics, but there is still some research needed in this field, especially in combination with Piskorski’s framework. Considering social relationships life knows countless ways to break our hearts, both from a friendship and of course from a romantic perspective. In my opinion, there exist psychological, personal problems that are creating social failures which no machines, algorithms and platforms can solve, as the human mind of each individual personality is (too?) complex. An example: A social platform helps two people, who have just split up from a previous relationship, to get to know each other. After having some really nice conversations on- and maybe also offline, one of them realizes the experiences of the previous relationship still hurt too much and he or she is not yet ready to open up. The tragic result is (new) heartbreak for at least one of them. This example actually kind of covers both abovementioned issues (A and B): Do social platforms increase or create social failures by not being able to overcome psychological, personal problems? Well, actually, you can’t blame the platform on offering additional opportunities to get to know new people and probable love affairs. This kind of heartbreak could also have happened the same way if these people got in contact first in the offline world, e.g. in a public space like a bar. The personal problems that one of these persons has and which create the (romantic) interaction between both of them not to happen is not the fault of the social platform. But you have to admit it does not help in solving the mentioned personal problems that occur in the offline world either. Yet, the following, rather philosophical question remains: Would these two people have been better off, if their (in the end failed) social interaction, that has been initiated by the social platform, would not have happened in the first place? As mentioned before, there do already exist several studies analyzing both negative and positive influences of social platforms on social interactions but there surely is more space for academic research here. It would be especially interesting to see if these studies (or new aspects) can be linked to Piskorki’s framework in order to see, how well the four dimensions are actually able to solve social failures. Anderson, B., Fagan, P., Woodnutt, T., & Chamorro-Premuzic, T. (2012). Facebook psychology: Popular questions answered by research. Psychology of Popular Media Culture, 1(1), 23–37. Krasnova, H., Wenninger, H., Widjaja, T., & Buxmann, P. (2013). Envy on Facebook: A Hidden Threat to Users’ Life Satisfaction? Wirtschaftsinformatik Proceedings 2013. Muise, A., Christofides, E., & Desmarais, S. (2009). More Information than You Ever Wanted: Does Facebook Bring Out the Green-Eyed Monster of Jealousy? CyberPsychology & Behavior CyberPsychology & Behavior, 12(4), 441–444. Piskorski, M. (2011). Social Strategies That Work. Retrieved March 25, 2016, from https://hbr.org/2011/11/social-strategies-that-work. Piskorski, M. (2014). A social strategy: How we profit from social media. Princeton u. Oxford: Princeton University Press. Wilson, R., Graham, L., & Gosling, S. (2012). A Review of Facebook Research in the Social Sciences. Perspectives on Psychological Science, 7(3), 203–220. More and more often algorithms determine our world. Google search is obviously based on an algorithm, movie proposals in Netflix are derived from an algorithm, the products Amazon is recommending to us are calculated by an algorithm, and our newsfeed on Facebook is determined by the Edgerank, an algorithm. And there are a lot more examples. While algorithms are convenient (and cheap) – no human effort is needed during execution –, the question remains whether they are also effective and wise. Can you really “calculate” (and that simply is what algorithms do) human behavior? And even if one could, would we human beings want to be calculated? Or wouldn’t we just for the sake of demonstrating that our actions cannot be calculated decide differently? And how do these algorithms change our behavior and thinking? Have you realized that you already have altered some of your actions, so that the “machine” can “understand” you? And if these algorithms just recommend to you what you like (movies, music, news articles, books, products, locations, opinions etc. ), how do you ever get your sight on new thoughts which usually are much more enriching for your life? As many have pointed out already, data are at the core of the digital economy. Data are the digital fuel, they drive digital businesses. The more and better data you have, the more and better services you can offer. Whether it is personalization, predictive actions or matching, all require data. What is important is not so much the amount of data you collect from each single user, but the combination of the data of your (and maybe even partners’) users. I am honored to be part of the Advisory Board of the Secretary of Commerce of the German state North Rhine-Westphalia (http://www.digitalewirtschaft.nrw.de/beirat/). The objective is to advance digital business in the state.